Unless you’re a chronically attention starved celebrity, this is one word you would not want to hear. 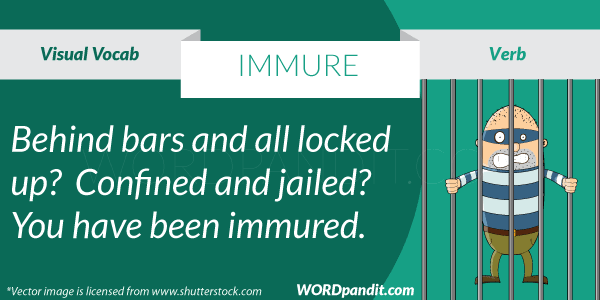 Immure means to be locked up, often referring to jail time. 1. To confine within or as if within walls; imprison. Immure sounds a lot like I am yours, please enclose me in the walls of your heart and never let go. Thus immure is trapping someone is a closed space, although it would not be advisable to use this in your next love letter! 1. We are all immured in the illusion world we have created. 2. The poor teaching patterns by teachers have made students feel like they are immured.